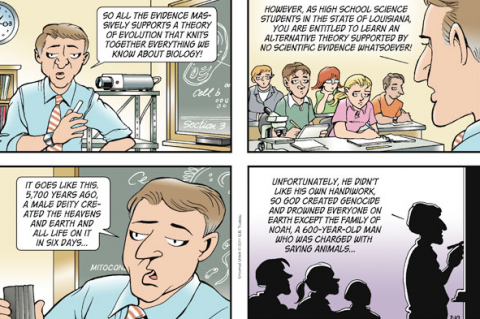 Garry Trudeau has taken on creationism before. He's doing it again, this time commenting on the oxymoronic "Louisiana Science Education Act," which allows the teaching of creationism in the public classroom. You can view Trudeau's cartoon in full, and in high res here. I agree with the poster above me. Also I see nothing oxymoronic about the name “Louisiana Science Education Act”. If creationism is true then science can clearly function with religion existing as well. Evolution isn’t neat and tidy either. And Doonesbury isn’t exactly the best resource to gather support from on opinions. It’s humor is (may I say?) a bit too sophomoric. You don’t need a “reason” to be here. Each person has their own “reason” for living life the way they choose. And why is it, that because someone believes in evolution and not creationism, it means the “universe will not care when you die”. I’m sure the person’s family, friends, and others close to him or her would beg to differ. To the second poster, “if creationism is true then science can clearly function with religion as well”. The problem with your comment is that creationism has never been proven true. It’s all from a book and nothing else. There are thousands upon thousands of scientific evidence of evolution. Evolution needs to be taught in science and creationism needs to be taught in a religion class. High school students should be allowed to take religious classes in school (as a means of learning about other religions).